Head to Prince of Wales Island in the breathtaking southeast region of Alaska, and experience an incredible Alaska cave, El Capitan, the largest known above-ground cave in the Last Frontier. The island itself boasts over 600 caves, all varying in size, with El Capitan being the largest and most recognized of them all. 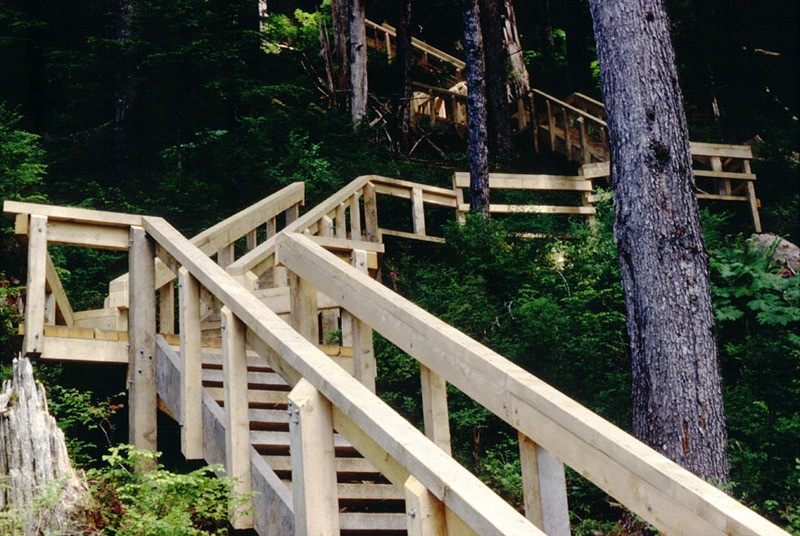 A wooden staircase through the lush Tongass National Forest leads to the cave’s entrance. This middle-earth experience is filled with an abundant amount of natural history and excellent wildlife viewing opportunities. El Capitan Cave is a fairly isolated treasure located deep within the Tongass National Forest. The El Capitan cave entrance faces south across the shallow El Capitan Passage, which provides a spectacular view overlooking Kosciusko Island on the Alexander Archipelago. To access the cave’s entrance, one must either be shuttled to the area on skiff or by plane, or drive down a long gravel road to the trailhead. Below the cave you’ll find a forest service camp, which gets its water from a spring that emerges below the cave. 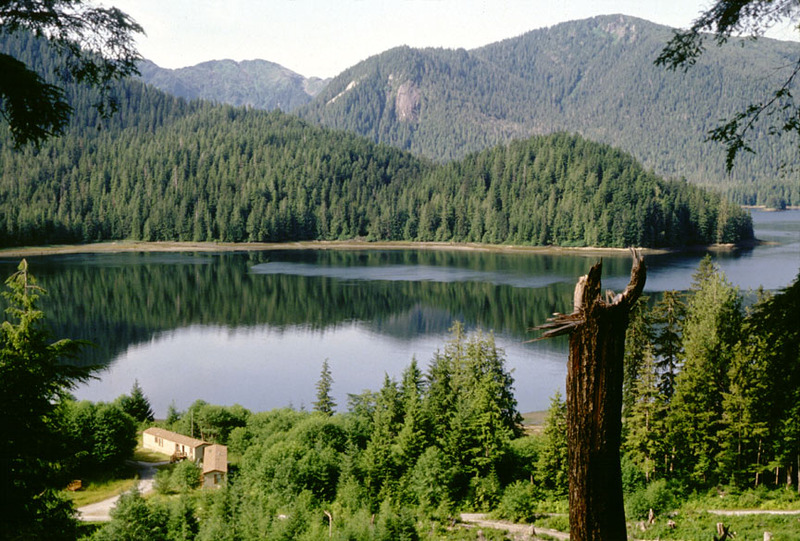 Enjoy tours of this enchanting attraction by knowledgeable forest service guides. During the peak travel season of May through September, free naturalist-guided trips are offered by the USDA Forest Service. Independent trips inside the cave are not allowed so making a reservation for a guided trip is necessary. The tour last approximately 2 hours. Contact the Thorne Bay Ranger District at 907-828-3304 to reserve a spot. The cave is closed during the winter. To learn more, click HERE. Upon arrival, you’ll be greeted by the most awe-inspiring views in every direction. Woo-sah… get ready to break a sweat! There are 367 steps leading up to the cave’s entrance, but don’t worry, it’s a lot easier on the way back down. Plus, the towering trees keep the area nice and shaded (perfect for a warm summer day). Southeast Alaska does get a lot of rain, so be sure to hold onto the handrails as the steps can become quite slippery when wet. The temperature in the cave is a constant 40 degrees, so make sure to have warm clothes with you. Also, proper footwear is a must. The wooden stairway that winds through the thick wilderness area boasts an impressive 370 steps in total leading up to the cave entrance. El Capitan is truly a nature-lovers paradise with many twists and turns that greet you along the way. The geological formations are impressive, while the signs of wildlife are exciting to spot. The cave serves as a home to bats and river otters. Two different species of brown bats use the cave most frequently during the winter months. Small organisms such as amphipods, collembolans and mites are also found in the small pools scattered inside the cave. Along the way you’ll have plentiful opportunities to soak in the majestic middle-earth environment that surrounds you. But remember that you are in the middle of the wilderness, so you’ll see your fair share of surprises along the way. 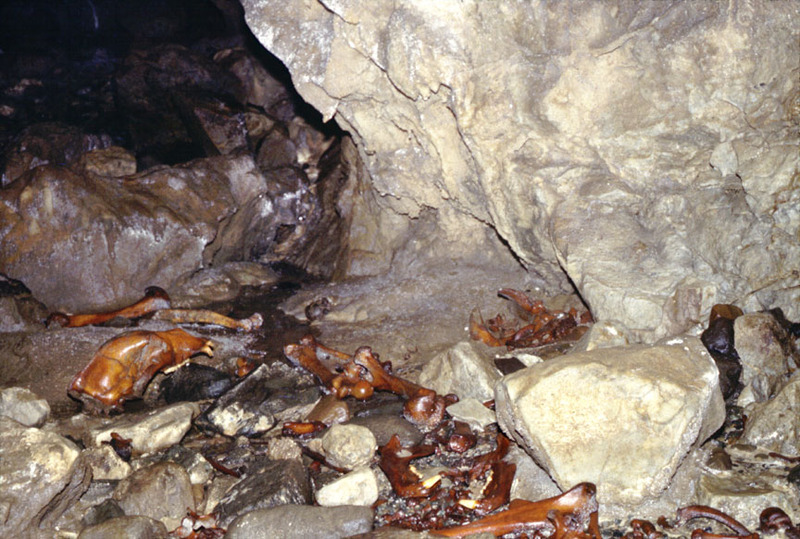 This Alaska cave has served as a home to a wide variety of wildlife throughout the years. 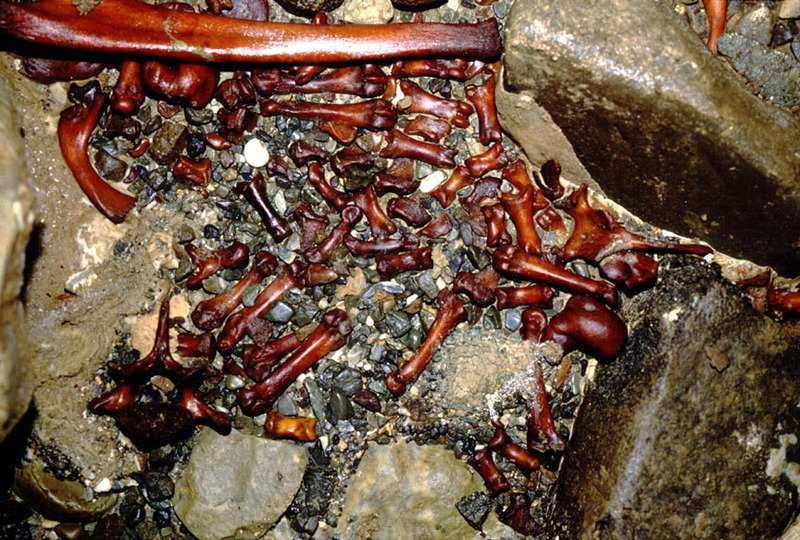 In fact, bears have used this Alaska cave for thousands of years, with remains from brown bears dating back over 12,000 years. After a long, harsh Alaska winter, you never know how stable these caves will be. Remember that the earth is constantly shifting (Alaska gets an average of 1,000 earthquakes per month, or 33.3 per DAY) so using extreme caution is a requirement here. Caves of any kind are very dangerous and contain fragile areas, so be careful as you navigate through this tremendous geographical wonder. When you reach the Alaska cave entrance, this obligatory caution sign will greet you with a warning that you don’t want to ignore. This is Alaska’s largest and longest known above-ground cave. Enjoy learning about the geological explorations of this 13,000-foot solid rock cave. Looking for more where that came from? If you enjoy fresh air and experiencing Alaska’s breathtaking natural beauty, be sure to check out these 13 Alaska hikes under 3 miles that everyone will love. We’re positive that you’ll also enjoy The Alaska Life’s treasured tiny towns road trip that will lead you through the most spectacular amounts of scenery. Be sure to let us know (in the comments below) what your favorite Alaska cave destinations are. If you love getting outdoors and experiencing all the fascinating geological formations that The Alaska Life has to offer, we want to live vicariously through you! Share your favorite Alaska cave moments with us on our Facebook page by clicking HERE, and they might just end up being featured in one of our next blog posts. Did not know about that cave, lived in Alaska many years. Now live in Missouri. Lol I use to live in Missouri, now my home is Alaska! Since it’s unlikely for most (who don’t have gear and caving experience) to visit this cave… it would have been better to see at least a few more interior shots instead of just the stair walk up to it. Maybe we can even do a video on it soon! Thanks for the feedback! Took a trip through the cave about 10 years ago and I still remember it well. Not your touristy trip, but rather you get the feeling that very few people have gone before you. Bring a good flashlight and be prepared to leave a little dirty, but well worth the trip. It is a long drive down a dusty or muddy road! We’re planning on taking the grandkids this year. We lived at ElCap from 1990-1993, in the South Coast Construction camp. While there, a group from National Geographic came and filmed inside the cave for an article…They stayed at the First Service Camp. There were no stairs then, and no guided tours, you went in at your own risk. A friend an I hiked up the trail and went in aways…Not far tho..There were big holes with water in them, and who know where the bottom was…It was awesome, how it could be like that in the mountain. This is amazing to see how they have made it so much easier to hike up there and the improvements..
It’s the Forest Service Camp….NOT First Camp….I tried to edit it but can’t… Also 3rd line from the bottom should say…Who KNEW where the bottom was….Not KNOW…..Thanks you. My tablet changes words. Thank you for sharing this with us!!! Now we have one more great thing to plan in Alaska!!! Great article, but I agree I was hoping for more cave pics. Thanks for taking the time to write! 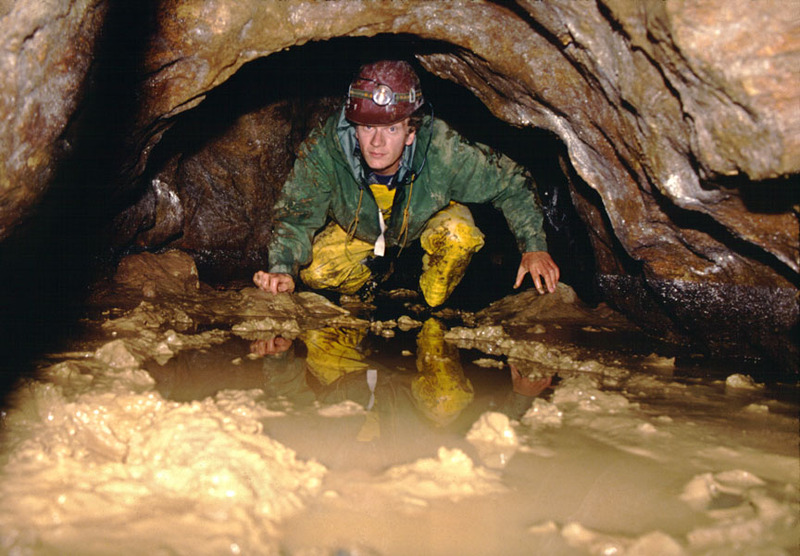 While living in Petersburg in the 1990’s a couple of Forest Service spelunkers gave a presentation with slides and videos of El Capitan and several other caves on Prince of Wales and maybe Baranof too. It’s been a while back so don’t recall everything. They, at that time, were planning to do guided walks through some of the more “safe” caves. The last picture is a photo of my husband, Dan Monteith. How can I get a copy of it? Please reply to my email address. I had the privilege of exploring this cave with the Tongass Cave Project in 1991-1992. I linked 2 maps to find a better entrance to access the bear den. Great cave! I worked on the Tongass NF and lived on POW in 1989. We stayed out at the Forest Service camp many times and loved exploring this cave on our own after working in the woods all day. There were no stairs, hand-rails, or guides and we used our headlamps and wore our rain gear and xtrtuffs. What about the huge cave on Mitkof Island? Thought it is 2nd largest in northern hemisphere….